At this point, I’m still hard at work building my Dark Age forces for Dux Bellorum. But, I wanted to play with the rules a bit, so I used some proxy armies to stand in until I finish, and played a game against my son, Danny. This was the first game for both of us. The armies I chose were already based on Impetus-style stands, and were Ancient Canaanites and Sea People. The composition of the two proxy armies were close enough to those of the Dux Bellorum army lists that I could use them with very little adaption. So, the Sea People became my virtual Irish (My son’s command) and the Canaanites became Romano-British (My troops). For this game, we did not use any of the built-in strategies and tactics except for giving the Sea People the Chariot option (Because that’s what they had). Also, I fudged the list a bit by giving the Canaanites an extra skirmish unit. The Sea People army, thus was composed of 3 chariot units (including the general), 5 ordinary warriors, 1 skirmish unit with bows, and another with javelins. 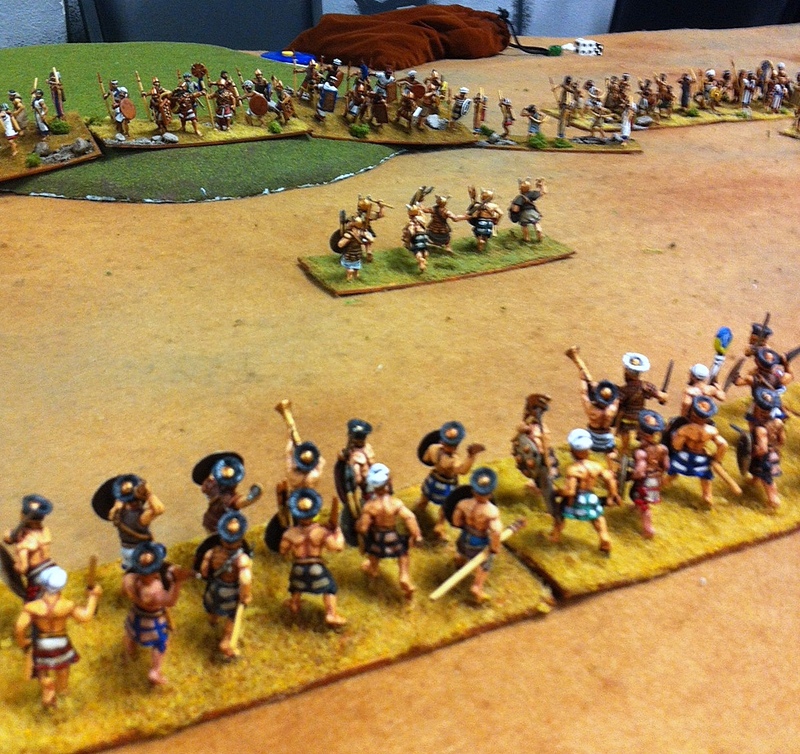 The Canaanite army had a foot companion, 3 noble shieldwall units, 3 ordinary shieldwall, and 3 skirmishers. The Canaanites were the repellers, so I set them up in two main groups, with the general plus 2 shieldwall occupying a hill on the right and the three remaining shieldwall set up on some open ground on the left, facing a small patch of forest. 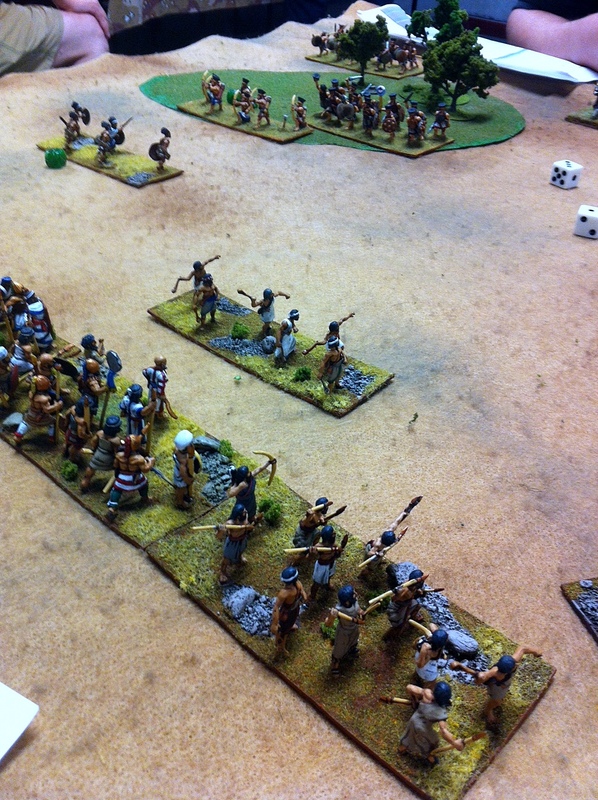 The skirmishers were spread out more or less evenly across the front. The Sea People set up in three groups: One large group of of 3 warrior units on their left facing the hill, and two warrior units plus both skirmishers in the patch of woods to their right. The chariots hung back menacingly in a group near the center behind the main line of warriors. On turn 1, the Sea People began to move forward. The large group of warriors on the Agressors’ left made good progress, and the skirmishers emerged from the woods. However, one of the units of warriors in the woods failed their bravery test and wouldn’t budge. In response, the Canaanite skirmishers ran forward to shoot missiles at the enemy while the two shieldwall groups held steady. 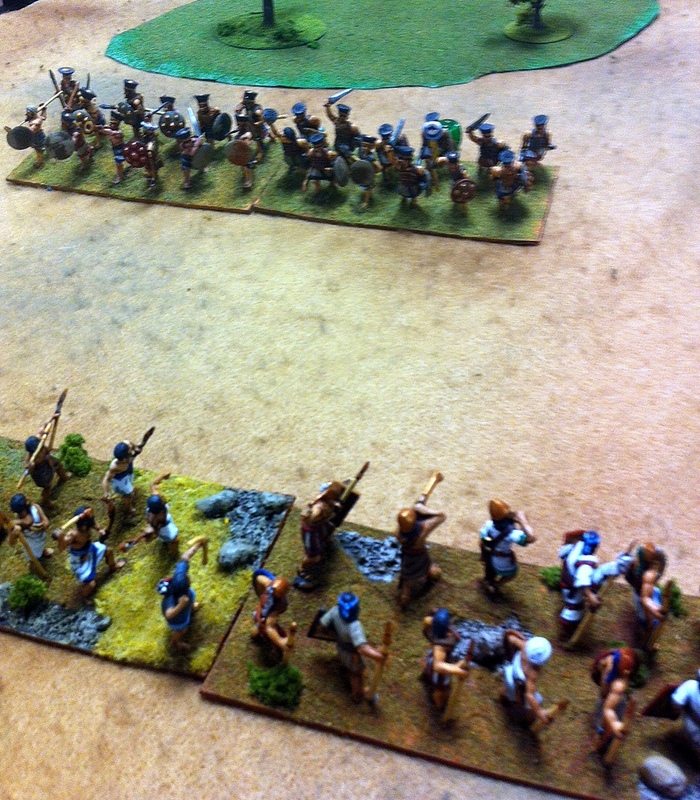 By Turn 2, the skirmishers of both sides were within missile range of their enemy and a very spirited exchange ensued. Danny’s main group of warriors moved forward toward the shieldwall occupying the hill, but he kept the chariots back, out of range. However, the unit in the woods failed another bravery test and he decided to move its partner unit to the edge of the woods and no farther until he could get the reluctant warriors moving to join them. Casualties began to mount among the skirmishers of both sides. By turn three, the main group of Sea People warriors were now within charge range of the hill. A unit of their skirmishers were driven off, however, and now Canaanite missiles were beginning to fall among the formed troops. Danny now spent extra leadership points to boot his reluctant warriors on the right forward, trying to get them lined up with their sister unit holding the edge of the woods. The Canaanite shieldwall continued to hold their position. I wasn’t about to give up the advantage of the hill. On turn 4, the Sea People infantry charged up the hill and crashed into the shieldwall. There was a vicious battle here, with both sides taking casualties, although the Canaanite defenders were obviously coming out ahead in the struggle. The warriors in the woods were now lined up and ready to move forward. 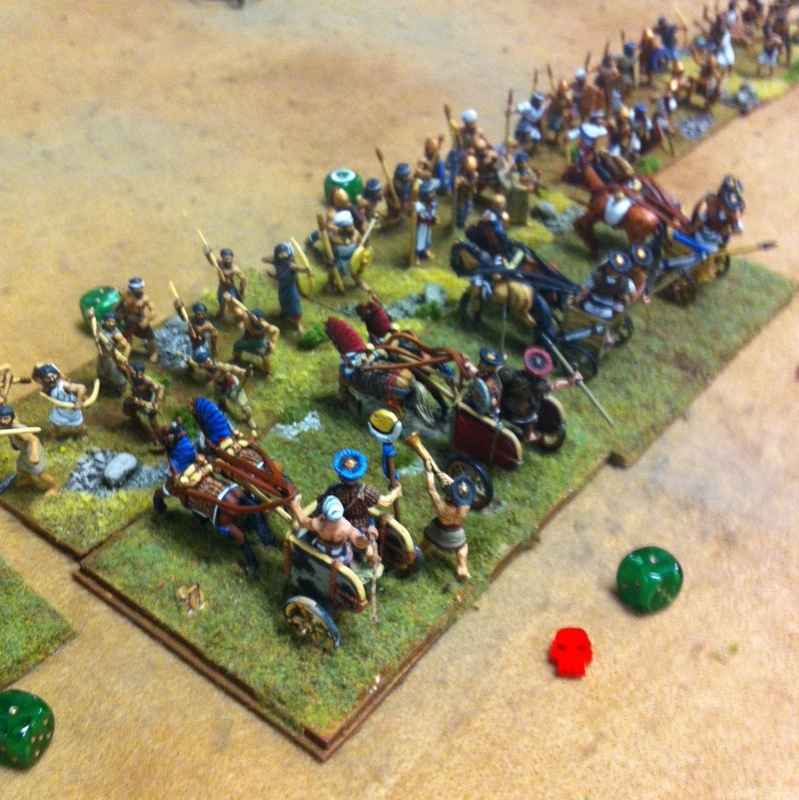 The chariots still did not enter the fight, but shifted position slightly to face the shieldwall down on the open ground and move within charge range. 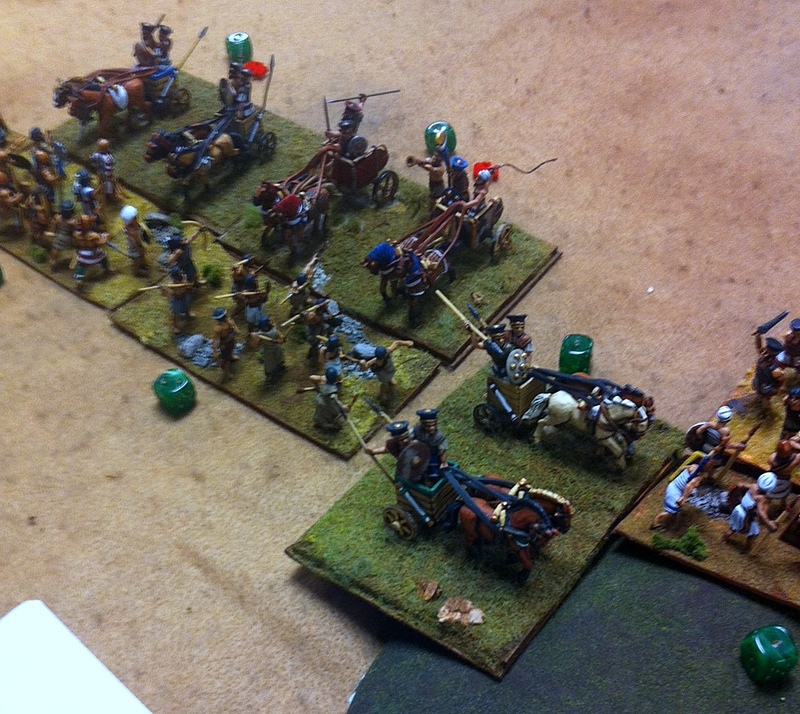 Most of the skirmishers on both sides were now gone, leaving the fight to the bigger formed units. On turn 5, the chariots, including the Sea People general, rolled forward and crashed into the shieldwall roughly in the center of the Canaanite line. On the hill to the chariots’ left, the battle raged and a few units on both sides were now within one cohesion point of breaking. 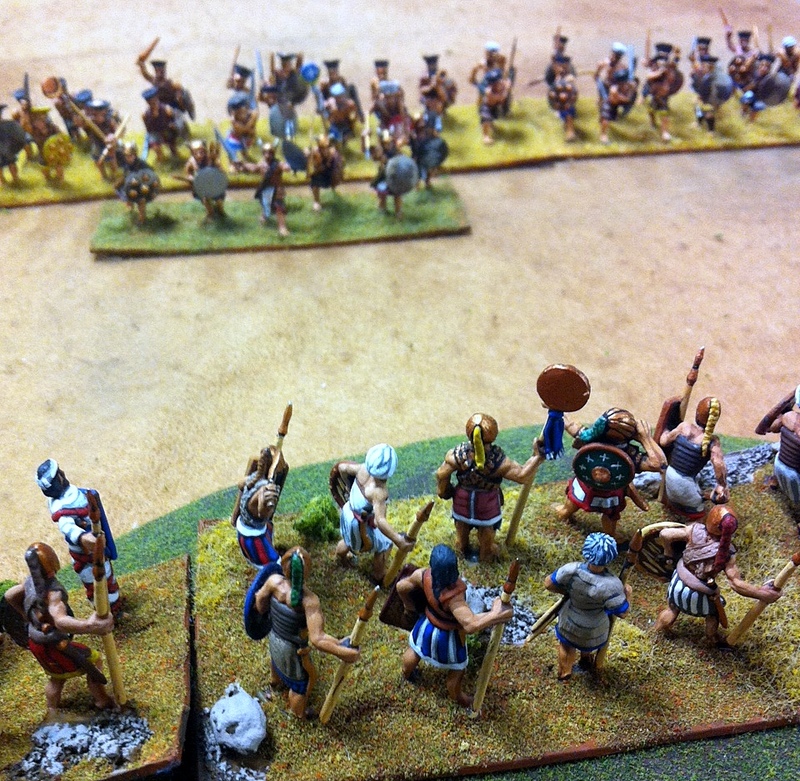 Finally, on Turn 6, two Canaanite units broke and ran, opening two big holes in the line. 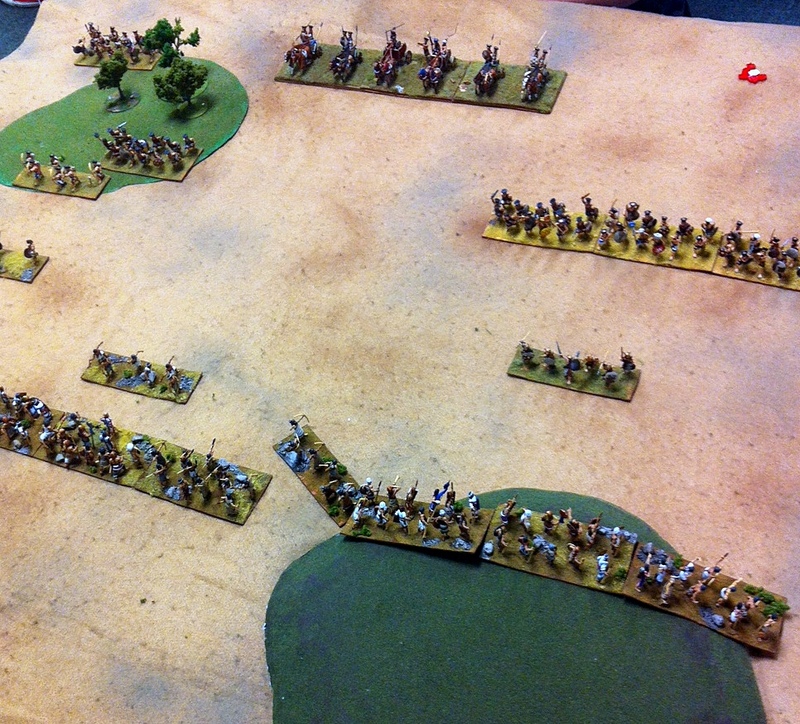 Danny quickly took advantage of this to push his troops into the gaps and to wrap around the men still remaining. The shieldwall down on the plain held firm, but the line on the hilltop was in tatters. By turn 8, the Canaanite general lay dead with his men on the hill, and army took a morale check. The men on the plain continued to hold, although the hill was now swarming with enemy warriors and they were now outflanked. It was at this point that they still-unbloodied Sea People warriors found the bravery to finally advance out of the woods toward them. It was at this point that we decided to call the game a Sea People win. Both of us enjoyed the game. The rules were simple enough that we eventually both stopped looking at the charts because we could tell what the combat modifiers would be at a glance. 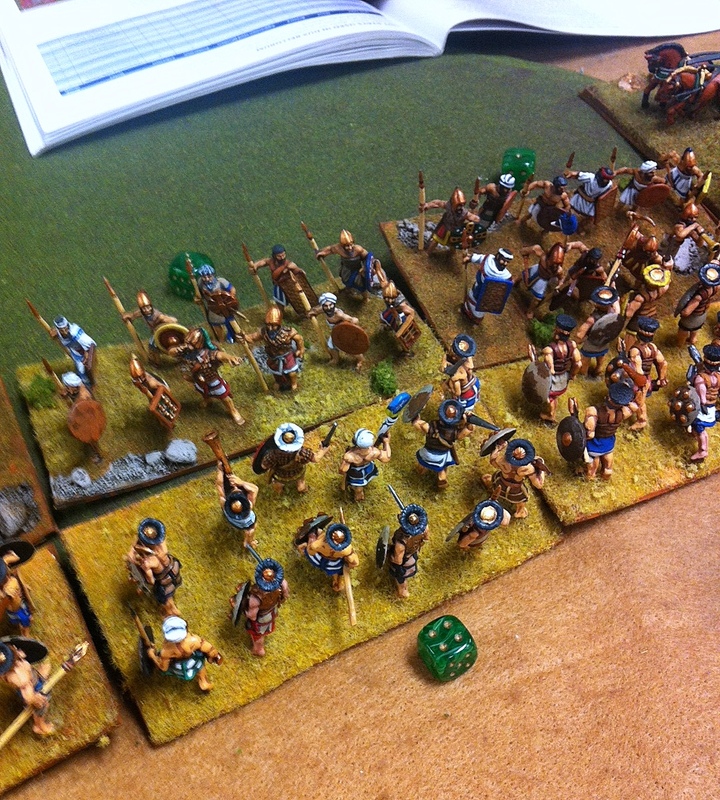 Armies are small, as well as the table itself, and this ensured that the game moved forward rather quickly. It’s worth noting here that this game was helpful in getting us acquainted with DB’s Leadership Point rule, and we were both able to clearly see that there is a certain amount of nuance involved with their use. During the early turns, we distributed the points to the skirmishers, mostly, to reduce casualties from missile fire as well as to try to maximize our own fire. Danny discovered that the LPs are essential to getting your line moving together, so he diverted a significant number toward boosting the bravery checks of the warriors stuck in the woods. Finally, during the big melees when the lines came together, LPs were now mainly used to add to the attacks (For the warriors trying to break the line) or to reduce hits received (For the shieldwall trying to hold the line). It became evident to both of us that using LPs required some care and that a mistake in how and where you spent them could mean the difference between victory and defeat.